September 9, 2013: Over the summer, the Project sat down with Lee Maynard (Gypsy Lee) who was visiting St. Louis to attend 2013 Pride and spend some time with family and friends. During his trip, the Project completed an oral history with Lee who shared recollections of his life in St. Louis in the 1970s. He performed as "Gypsy Lee" and was an active member of the LGBT community, participating in local events such as the Mandrake Ball. 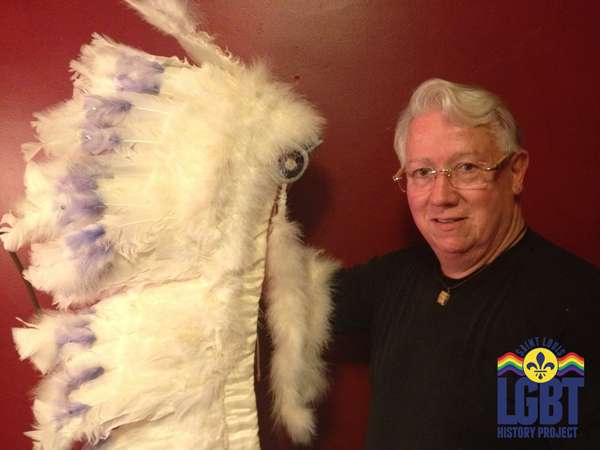 In addition to the oral history, Lee has donated several important artifacts to the Project, including one of his Cher inspired indian headdresses, along with artwork, and rare photographs from his performing days. The Project looks forward to continued discussions with Lee about additional oral history interviews and thanks him for these important donations for our archives. Today Lee lives in Connecticut and is a talented artist. Check our facebook page for a gallery of pictures. 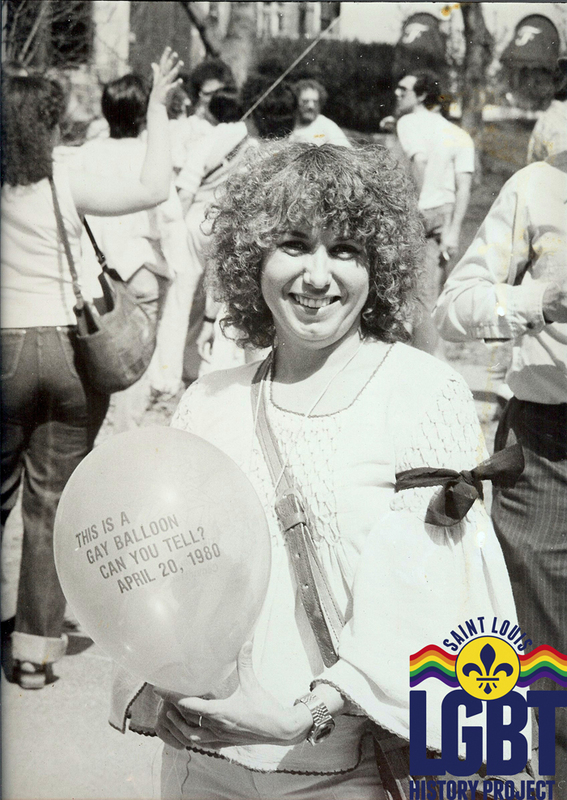 August 20, 2013: Last week, the Project received a rare photograph taken by noted photographer Wilbur Wegener at St. Louis' first Pride event in 1980. Here it is. The image is of Pat Murrell and she is holding a balloon. Not only is the image great, but so is the story of the balloon. Janet Utley was in charge of procuring the balloons and she tells a great story about going to a local carnival supply company and that at first they were hesitant to print balloons with a gay message, saying they "could not do such a thing," and Janet simply said," well, sure you can." Special thanks to Jim Andris for hosting an event at his house last week where Pat and Janet were joined by Judith Hunter and Jim Pfaff. These women were plugged in to the greater women's community that was associated with the activism surrounding the 1977 Anita Bryant fear campaign and before, and right on up to the 1980 Pride event and after. Their memories are invaluable. At Jim's house Jim Pfaff showed his color slides from the 1980 and 1981 St. Louis Pride events. The ladies did a great job of helping identify many people in the photos. The Project will be partnering with Jim Pfaff to showcase his rare images. More news on that to come. For now enjoy this great historic memory from 1980. Photo by Wilbur Wegener, April 1980. Donor Pat Murrell. 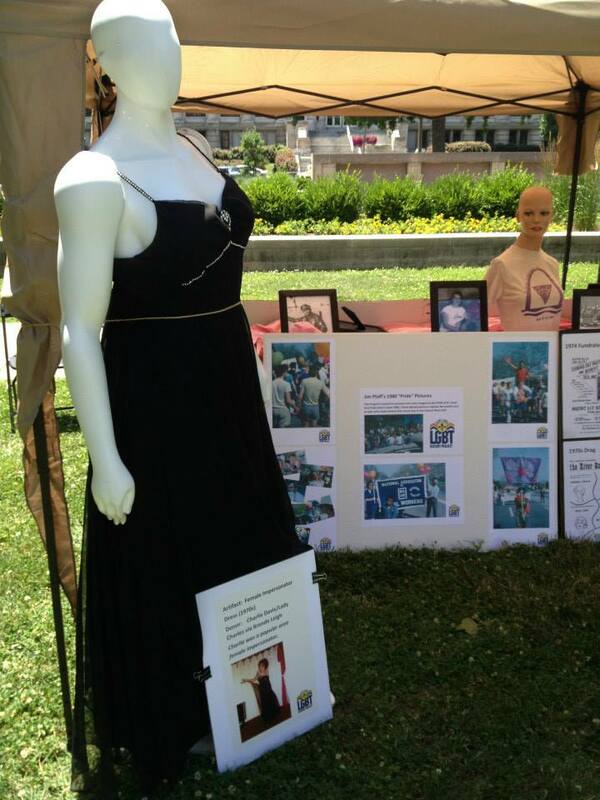 July 1, 2013: The Project was proud to provide an educational display at this year's historic 2013 St. Louis Pride - held in downtown St. Louis for the very first time. This year's exhibit featured some never seen before artifacts - including a black gown once worn by a popular 1970's St. Louis area female impersonator (Lady Charles/Charlie Davis). Thanks to the several hundred people who stopped by the exhibit. Many of you had new stories to tell and some artifacts to donate. 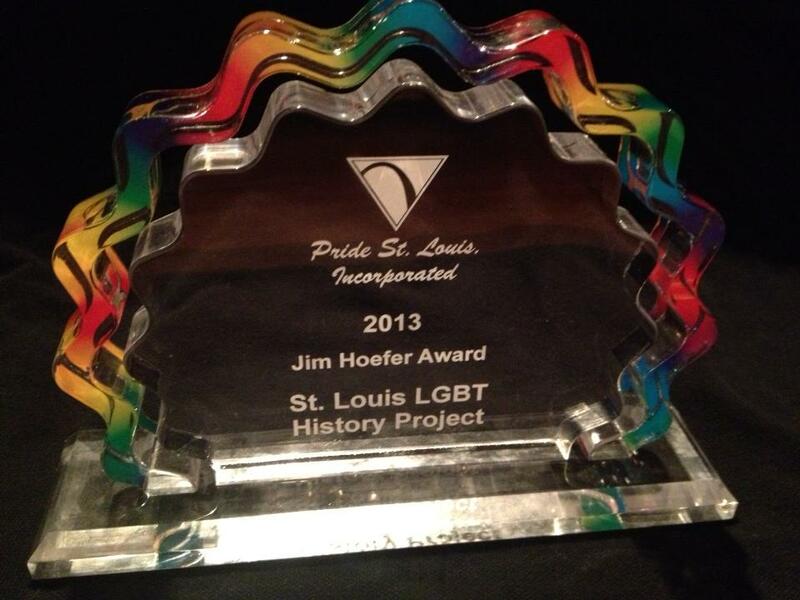 The Project was also honored by Pride St. Louis, Inc., this year with the Jim Hoefer award. Thanks to Pride St. Louis, Inc., and everyone else who has been so support of the Project. Keep those historic stories and treasures coming our way. June 5, 2013: The Project was honored by Pride St. Louis on June 4 at a special Pride month kick-off party held at Strauss Park in Grand Center. The Project is the recipient of this year's Jim Hoefer Award annually bestowed by Pride St. Louis. The award is presented to an organization that best exemplifies what it means to serve St. Louis' LGBT Community. A special thank you from Project team members Colin Murphy, Ian Darnell, and Steven Brawley to everyone who has supported our work! Don't miss our special history exhibit at this year's Pride being held downtown on June 29 and 30.